I was supposed to go to the opening performance of Morro and Jasp GONE WILD last week, but since the show was almost sold out there could be no ticket guaranteed. Determined to get it covered, I went to the 11pm show tonight. And after watching it, I have to admit, I feel pretty useless. With amazing buzz and sold out shows, these two clowns are hardly in need of my paltry words. But for those few who haven’t yet decided whether to go or haven’t yet even heard of the show, let this be your confirmation that this is a show that cannot be missed. 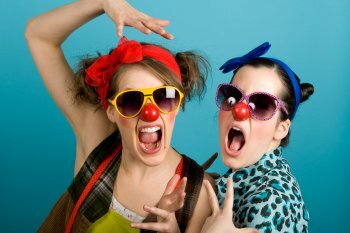 Morro and Jasp GONE WILD is the third in a series of shows featuring the clowns Morro (Heather Marie Annis) and Jasp (Amy Lee), two sisters now teenagers and looking to go on a wild road trip for their spring break. Unfortunately, a wacky car crash strands them in the middle of the woods with seemingly no way of getting back to civilization any time soon. Right from the moment the audience walks in, Morro and Jasp are on stage bickering over radio stations and openly welcoming audience members in. The energy and hilarity only go up from there and the clowns definately justify the title of the show. Wolf bear sightings, mardi gras beads, pool noodle beatings and a lesson with cucumbers are just a few of the many knee slapping moments of the show. If you’re not a fan of audience participation of any sort, be warned, this show has a lot of it. By the time they get to it though, the audience in our performance were more than willing to take part and watching Morro and Jasp’s ability to think on the fly was a highlight of the show. Simply put, Morro and Jasp GONE WILD is clowning at its best. It’s theatre at its best for that matter. The story is solid, the performances are outstanding and the shenanigans are wildly hilarious. If you haven’t seen this show yet, make sure you correct that before the Fringe ends. There are just two performances left, and judging by the sold out crowds, it’s definately best to book in advance!